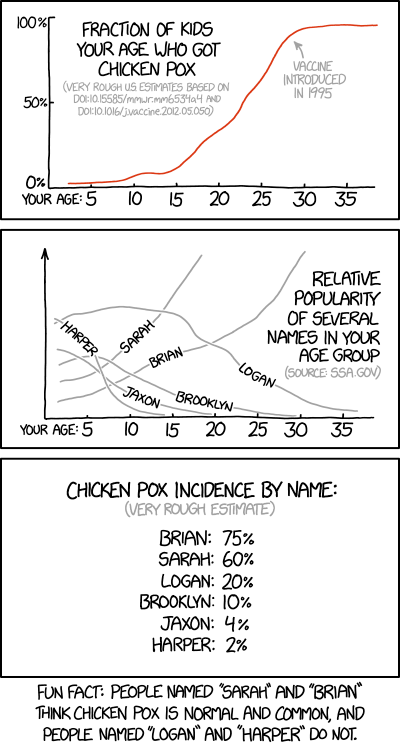 Clearly, stop vaccinating your children, and name them Brian. All of them. EDIT: I was trying to make a joke about how people misinterpret statistics, and then I realised I'd ACTUALLY misread the results. I meant to name all the kids Harper, not Brian. Oh, the irony. I'll get me coat. Last edited by Ripper; February 7th, 2018 at 22:29. As long as you vaccinate yourself, all is okay. Climate change deniers will love this. pibbur who knows that hurlses don't wear mullets, but unlike everything else, doesn't know anything about ozzies and mullets in general. Last edited by pibbur who; February 27th, 2018 at 12:44.
Business in front, and a party at the back. From the What If site (https://what-if.xkcd.com) which offer serious scientific answers to absurd hypothetical questions. Very likely tl;dr.
Not that many! I mean, it's definitely one of those gigantic numbers with lots of zeroes, but in the grand scheme of things, there aren't as many zeroes as you might expect. There are two numbers: "zero" and "anything that overflows your data type." Our first question: Where does firefly light even come from? Fireflies may look like they're full of glow-in-the-dark goo, but the light they give off actually comes from a thin layer on their surface. Lots of insects have glowing surface patches, and some of those patches have been studied carefully to calculate their brightness. A 1928 paper on beetles called "headlight bugs" found that their glowing patches, which were a little over a square millimeter in area, emitted about 0.0006 lumens of light. Fireflies have luminous organs (bright patches) that are about the same size as those of headlight bugs, and their organs tend to have a similar peak brightness per area, so this figure is a good guess for the brightness of a firefly's lantern. Firefly lights aren't "always-on." They blink on and off, with patterns that vary from species to species and situation to situation. These flashes carry information, some of which you can decode using this delightful chart. I don't know why I find that chart so satisfying, but I do. It's like that chart of sand grain sizes in article #83. To get the brightest light, let's assume we're using a species with a mostly-on duty cycle—like a headlight bug. How does its 0.0006-lumen light output compare to the Sun? The Sun's brightness is 3.8×10^28 lumens, so by simple division, it would take 3×10^31 of those fireflies to emit the same amount of light. That's a surprisingly small number; adult fireflies weigh about 20 milligrams, which means 3×10^31 fireflies would only weigh about a third as much as Jupiter and 1/3000th as much as the Sun. In other words, per pound, fireflies are brighter than the Sun. Even though bioluminescence is millions of times less efficient than the Sun's fusion-powered glow, the Sun can't afford to be as bright because it has to last billions of times longer. But wait! A mass of fireflies that big would run into problems. Besides the obvious problems with gathering that many animals in one place, the fireflies would block each others' light. The inner fireflies would be hidden behind the outer ones, and the total brightness would be limited. Since the only light that matters is the light at the surface, we could imagine arranging the fireflies in a hollow sphere, with their lanterns pointing outward. Or, to make thing simpler, we could imagine a single giant firefly. How big would it need to be? Since we know our firefly will need to give off about 3×10^31 times as much light as a normal firefly, it will need a glowing patch 3×10^31 times larger. Since surface area is proportional to length squared, our firefly will have a body length √(3×10^31)=5×10^15 times longer than a normal firefly, which would make it about the size of the Solar System. Since mass is proportional to length cubed, our firefly would weigh (3×10^31)^(3/2)=1.6×10^47 times as much as a normal firefly, which works out to about half as much as the entire Milky Way galaxy. Such a firefly would immediately collapse under its own weight and become a black hole. In fact, given the distribution of galaxies in our universe, there's an upper limit to how large black holes can grow, and this firefly would be bigger than that limit. That means our firefly would become the largest black hole in the universe. It would give off a lot of light as it devoured our galaxy, and then, eventually, it would give off none at all. Black holes last a long time, but they eventually evaporate through Hawking radiation. When the black hole era of our universe comes to an end, black holes will evaporate one by one, with the smallest evaporating faster. Since our firefly's black hole would be the largest one in the universe, it would be the last to evaporate—a final outpost of irregularity in a universe fading toward heat death. We should probably add that to the identification chart, just in case. There's some stuff before but it's not important. pibbur who would like to inform the (ozzie) watchers that there is an article about the gravitational pull of spiders. Last edited by pibbur who; March 2nd, 2018 at 10:48. On the 4th of October 1951, Henrietta Lacks (31) died from cervical cancer. A couple of months before her death, a sample of cells were taken from the tumor. 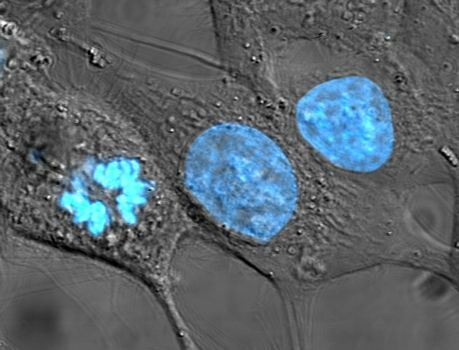 These cells turned out to be "remarkably durable and prolific", giving rise to a line of cells that would divide and divide and … (in 2018) still divide. Normal human cells, and even cancer cells will (regrettaby) stop dividing after a few generations. The cells are called HeLa cells, after mrs. Lacks. The cell line is used extensively in biomedical research, testing of among other things drugs and environmental factors, and as a growth medium for viruses (viruses can't proliferate outside cells, and for viruses infecting humans, human cell cultures are especially useful). The Salk vaccine against poliomyelitis was developed using HeLa cells (poliovirus could until HeLa only be grown in human and simian nervous cell cultures). According to Wikipedia almost 11000 patents are connected to HeLa cells. Since 1951 20 tons of cells have been produced, the number of HeLa cells thus far exceeds the number of cells in Henrietta. Due to ongoing mutations there are now several genetically different lines of HeLa cells. The use of her cells raises several ethical and privacy questions, most important is the fact that the cells were taken from her without her knowledge and consent. Today the Lacks family is involved in deciding the use of the cell line. Last edited by pibbur who; March 11th, 2018 at 00:23. I might try it again tomorrow, but with a fried egg added to it. Can I call you Dagwood? That's a name I haven't heard in years. There's a book about her, and being most cynical, this is more or less exploiting a person's genome - without giving her or her family a share of the profits, not even the patents. It's like Biopiracy 3.0, so to say. Cricket. Weird sport, and incomprehensible to regular people (those living outside Oz. And a few other minor countries). Yet another strange aspect of the sport: Use tape on the ball when throwing, and afterwards put the tape down into your trousers. I'm not sure about why, and also if the same piece of tape is used again and again (might be a bit unhygienic), or if there is a supply of fresh tape readily available. According to some papers, the practice is considered cheating, and those doing it (and are discovered) are very sad and regretful. Given what I know (and especially don't know) about cricket, I suspect this is fake news. As I've said: lots of weird things are going on in the sport, and I'm not surprised if players become a bit confused by the end of those week-long matches. pibbur who tries to think of insects when thinking of cricket. PS. Did you know that crickets (there are 900 species of them) have ears on their front legs? DS. Last edited by pibbur who; March 26th, 2018 at 17:35. PS. About 10 years ago a gamma ray burst (GRB0803198) appeared in the sky and was visible to the human eye for 30 seconds. Based on redshift measures, the explosion happened 7.6 billion years ago, making said GRB the most distant object ever observed without a telescope. (The previous record was held by the Triangulum galaxy, a pathetic 2.9 million light years away from us). This illustrates the huuuuge amount of energy released from these things. Admittedly in a very narrow beam, however this one was focused directly towards the earth, and could therefore have been a problem if it was closer. Fortunately, at 7.6 billion light years, it's harmless. But I wouldn't want to live, say within the order of 10000+ light years from it (in the direction of the beam). We haven't observed any GRB's in our galaxy, which doesn't mean it hasn't happened, and can't happen. GRB's are actually quite rare. There is however one star, WR 104, that maybe, maybe, maybe will produce a GRB when it dies. At 8000 light years, it could be a problem, if we're targeted. And since the rays travel at light speed, we won't know until it hits us. BTW, it's speculated that a mass extinction 450 million years ago could have been caused by a GRB. DS. I'm surprised the Norwegians are puzzled by cricket. It is, after all, a system of mysterious rules and conventions, known only to the initiated, with transgressions punished by everyone being slightly miffed. I liked this advert for renewable energy.